We’re going to close out this series with some things we can learn to hold our ground with ourselves, while simultaneously reaching some new heights we may have thought impossible. It focuses on us becoming the best version of ourselves so we can lead our companies more effectively. A big part of that is to keep our focus on what we’re doing, who we’re serving and how to best reach those people. Failure to focus – to remain however narrow is most powerful (which means effective, profitable and sustainable) – can wreck us and our companies. Niching down doesn’t necessarily mean going too narrow. It means remaining narrow enough to leverage our resources. That’s why we’ve been talking about the things that really impact these things. As CEOs and leaders, it’s US. Quite frequently we’re the reason our marketing is ineffective because we chase too many markets. Too much noise, too many distractions influence us to broaden out rather than narrow down. And it can fragment our energy, our resources and our people…resulting in being less effective – not just in our marketing, but in our operations, too. The word for this episode is DISCIPLINE. For business leaders, it’s self-discipline. For our businesses, it’s self-discipline. Lack of it is what destroys us. Saying NO is hard. For some, it seems impossible. They’re always searching for something else…something more. Discipline demands we be more discriminating. It requires narrowing our focus. Discipline is the ability to eliminate distractions and things that don’t matter as much. By now you should be seeing an even greater value in leaning things down…not just in your marketing, but in all phases of your operation. Our businesses may be complex, or simple. Pharmaceutical companies admittedly operate a more complicated business than lawn service companies. I’m not talking about the complexity of the actual businesses we run. Instead, I’m talking about the complexity with which we operate our businesses. I refer to it as WWO – the Way We Operate. No matter our business, the Way We Operate can surely be further simplified. Are you an NFL fan? Me, too. I don’t pretend to understand all the nuances of the sport, even though I played it growing up. Most teams have play books that occupy lots of gigabits on a tablet computer. Teams spend hours watching game film of their last performance – and the performance of an upcoming opponent. Eleven players are working in unison on each play in an effort to help that play succeed. One player misses an assignment, or fails to be in proper position – and fails to execute his role properly – and the play fails. Yet, in spite of all the complexity…the game still boils down to the basics of running, blocking, tackling, throwing and catching. Well, we could add kicking to the mix I suppose. But you get my drift. The fundamental elements of the game are quite simple. You can likely see your business in much the same way. Maybe you’ve got labs, research, manufacturing, legal and a host of other functions that make your business complex. Or maybe you’ve got a few trucks, some lawn mowers, weed whackers and leaf blowers. It still boils down to what I call the trifecta of business building: getting new customers, serving existing customers better and not going crazy in the process. When we look at our discipline in operating our enterprise we often find ourselves being UN-disciplined. Many of us get up each morning repeating yesterday’s actions. As the fire fight continues, we lose hope that things will ever – can ever – be different. Over time we grow complacent in the quest to improve and resign ourselves to the notion that “this is just how it goes.” No, this isn’t just how it goes. It doesn’t have to be this way. It’s this way because we’ve not been disciplined enough to jettison the crap getting in our way. Instead, we’ve piled on more crap, making it seem impossible to execute the mere basics of building a thriving business. Struggle begets struggle. Discipline begets discipline. That first one is much easier to develop into a daily habit. So that’s the one we most often go with. Path of least resistance and all that. A paradox…that struggle is the path of least resistance? Yep. Because we get lazy. You see it all the time. You hear it all the time. Seems almost everybody is putting out fires and all the other assorted activities that go with struggling. Maybe struggling is a bit of a badge of honor — and a ticket into the massive community of other miserable people. Whatever else it may be, it’s a habit. One you should decide to jettison right now. Without delay. But let’s veer over toward what we should be doing more of – embracing discipline. We need to do more than embrace it…we need to incorporate it into our lives. Discipline begins with the art (or science) of elimination. Eliminating the non-essential, the unimportant, the extraneous and the things that can wait. It’s hard work that will require THE major discipline factor – your own discipline to do the work. Self-discipline. And the accountability you’ll need to lead your team. Everybody has to be on board. Don’t let anybody run loose like a kitten chasing every ball of yarn that rolls across the floor. Your mind and imagination will be your toughest opponent. You’ll second guess things. You’ll wonder if something else might be more important. Stop it. Calm yourself knowing that by focusing on the few critical things you’ll be able to make more progress faster! I regularly illustrate this idea with clients by drawing a circle. If we think of the circle as representing the goals or objectives we can pursue, then we might consider each degree of a circle – all 360 of them – as being 360 different things we might pursue. 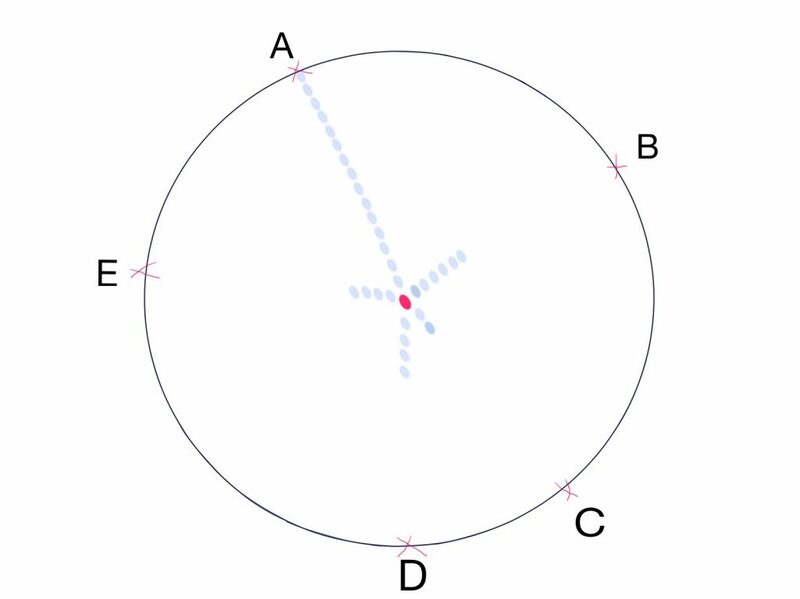 The starting point is in the center of the circle. Our work – the things we do in our business every day to push forward – are represented by a dot between the center of the circle and some X marked on the circle — the goal we’re striving to reach. What commonly happens in our enterprises is we want to hit multiple spots on the circle at the same time. We want to achieve goals A, B, C, D and E. If we’re operating a large enterprise with abundant resources, that’s doable. But most of us aren’t running businesses that large. Most of us have to really manage our resources with greater discrimination. That means we have to look at A, B, C, D and E and consider which is most important. We have to consider the value of hitting each mark. This isn’t about NOT doing multiple things. It’s more about making something more important. It’s about having a priority. It’s about niching down our work, which in turn fuels our ability to niche down our marketing (and everything else we’re doing). In a word…it’s about focusing our effort so we can be more effective and efficient. For small business, here’s the problem. We have limited resources. To marshall our resources to accomplish 5 different goals is likely to result in us achieving none of them. I’m suggesting we vet the goals, consider which ones are vital to our success. Which ones will help us thrive. Which ones will fuel our resources. Hint: it’s highly probable that it’ll be the ones that bring in revenue. That’s because cash flow, revenues and profits are the fuel we need to keep going. Without them, our business engine stalls (at best) or stops (at worst). We have to feed the beast. That means we need customers or clients. Paying customers or clients. Which means our marketing has to be able to provide some predictable, sustainable flow of prospects…which in turn means we have to make sure we’re able to convert a predictable number of those prospects into paying customers. 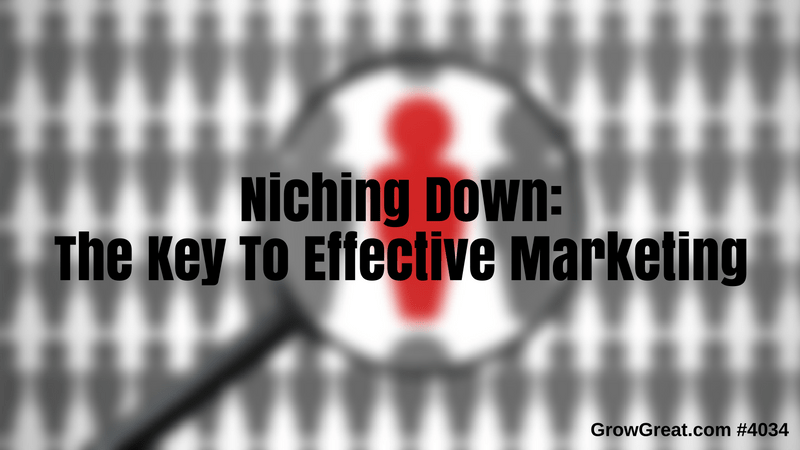 That’s what began this conversation about niching down so our marketing could be more effective. And here’s how this all fits together — by taking aim at spot A on the circle, we know exactly where we’re headed and the progress we’re making along the way. If we think of marketing like fishing, it’s easier to go fishing if we know exactly the kind of fish we’re hoping to catch. There’s no guarantee of catching anything, but we drastically increase our odds of catching a fish by first identifying the exact kind of fish we want to catch. Narrowing it down to a specific kind of fish makes all the difference. It helps us know where to go, what kind of bait or lure to use, what type of rod and tackle we need, what time of day to go and what kind of spot on the water is most conducive for the kind of fish we’re looking to catch. Here in Texas a common fish found in area lakes is the large mouth bass. So let’s say we’ve made up our mind that we don’t want to fish for anything other than large mouth bass. That excludes a variety of other fish also found in area lakes. Large mouth bass represents our A spot on the circle. It’s our focus. It’s what we want to catch. So we move all our resources to help us do that. We use only lures that appeal to large mouth bass. We go where large bass are most likely to be. We go a lake known to have a big population of large mouth bass. We do during a time of day known as a time when large mouth bass are most likely to be attracted to our bait. We do everything we can to improve our odds of succeeding in landing as many large mouth bass as the law will allow. Off we go. Right away we snag a crappie. It’s not a large mouth bass, but it makes us start thinking — “Maybe we should fish for crappie.” So we change our lure to something attractive to crappie. What happened to fishing for large mouth bass? Well, we got distracted and started thinking maybe crappie isn’t so bad after all. Next nibble we get isn’t a large mouth bass or a crappie. It’s a white bass. Once again we start thinking maybe that’s the fish we ought to chase. So we make more changes. You get the idea…we’re drifting with whatever happens to us instead of remaining focused and disciplined to get what we’re after. We’re not taking command of our resources, including our time and effort. Instead, we’re letting the lake (the market) dictate our direction. But it’s not intentional or directed and it can’t be trusted. Random success can happen to any of us at any time. The problem is you can’t build a sustainable business on random success. Sometimes there’s what I call a happy accident. Here in Texas we have large catfish in lakes. We’re in the boat fishing for large mouth bass. That’s what we’re catching. But we’re being discriminating even then by throwing some of them back. We’re only going to keep the best ones. Suddenly, we’ve got something else on our hook – a pleasant surprise. A whopper of a catfish. We weren’t looking for him. We weren’t pursuing him, but we landed him. He’s going to be supper. Sometimes we pursue a specific client and we land a happy accident. We can decide to keep them (and serve them) or we can decide not to. It’s our choice, but it shouldn’t alter our activities. We’re not suddenly going to quit fishing for large mouth bass. Those are the ingredients for making yourself and your business meaningful in the market. So narrow things down, marshall your resources where they can serve your company best then stay disciplined to keep moving forward so you can reach the goal. In a future episode we’ll apply these principles for your leadership and your team.